Heavenly Father, thank You for Your divine power. A power that breaks through every barrier and overcomes every obstacle. Thank You for making this power available to me. Forgive me when I don’t realize the power that is at my fingertips and when I let it go unused. 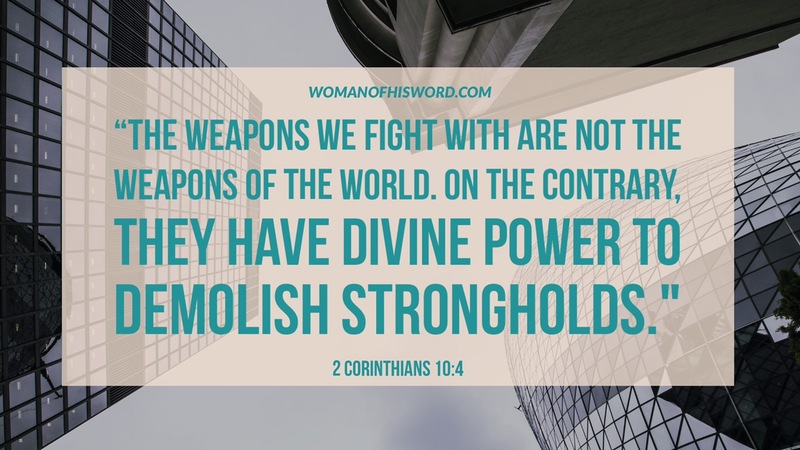 Open my eyes to this truth and equip me with Your heavenly weapons. Help me to put on the full armor of God and fight for those souls that are held captive. Help me to break down my own barriers and to conquer those areas the enemy has a hold of. I pray for those who don’t realize the power and authority that’s been given to them. The same power Jesus used to calm the sea, to feed thousands and to conquer Satan. Stir up Your power within them, equip them with a fighting spirit and give them victory over their lives. Please go before me this week, Lord. Help me to call upon Your divine power in all areas of my life. Give me the heart of a warrior, ready for battle and may my life be a living testimony for You and Your greatness. In Jesus’ name I pray, amen.